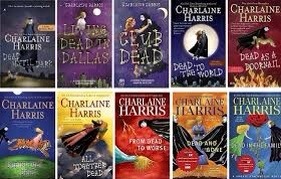 I don’t really have one anymore but I used to be absolutely obsessed with the Sookie Stackhouse/Southern Vampire Mysteries books. They were just really entertaining when I was in my paranormal romance phase 🙈. I don’t think I’ll ever read them again because they were just kinda problematic/cliché and I’m not really into that genre anymore. I don’t actually remember finishing the series and I only got to season 4 of the TV show so I’m not completely sure what happened at the end.